Be the first to share your favorite memory, photo or story of Tamara. This memorial page is dedicated for family, friends and future generations to celebrate the life of their loved one. 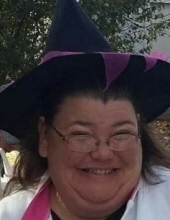 ALLPORT, Tamara Lynn - Age 49, of Swartz Creek, died Monday November 19, 2018. Funeral services will be held 1PM Saturday November 24, at Sharp Funeral Homes, Miller Road Chapel, our temporary location, 5363 Hill Rd., Swartz Creek (Mundy Township). Pastor Mark Cox officiating. Visitation will be held 11AM until time of service Saturday. Those desiring may make contributions to the family. Tamara was born on February 4, 1969 in Mt. Clemens, MI, the daughter of the late Alger Dennis and Charlesie (Koch) MacCauley. She married Troy Allport in Pontiac on July 19, 1996 Tamara enjoyed reading books and spending time with her family. Surviving are: husband of 22 years, Troy Allport of Swartz Creek; children, Josh Walters of Swartz Creek, Haley Allport of Mt.Morris; grandchildren, Montez Beasley, Madalynn Beasley and Mila Beasley. She was also survived by her siblings, Debbie (Dan) Sigsbee, Robert MacAuley, Rick MacAuley, David MacAuley, Ketrina Swanson, Alger (Tina) MacAuley, Sarah Love, and Geri (Dennis) MacAuley; many nieces and nephews. She was also preceded in death by step mother, Carolyn MacAuley and Sister Tona Hawley. Tributes may be posted at www.sharpfuneralhomes.com. To send flowers or a remembrance gift to the family of Tamara Lynn Allport, please visit our Tribute Store. "Email Address" would like to share the life celebration of Tamara Lynn Allport. Click on the "link" to go to share a favorite memory or leave a condolence message for the family.